Since I have populated my novels, The Merry Millionaire, and its sequel, Pomp and Circumstance with real life characters, whom my protagonists, Ronald Fry and Mervyn Watson, might easily have met along the way, let me introduce to you, Australian Pilot Officer, Adrian Cole, affectionately nicknamed, ‘King.’ I am proud to have included this brave man into my story, because he continued on to have an illustrious career in the Royal Australian Air Force, too long, I’m afraid to recount here, but well documented in the Wikipedia article. 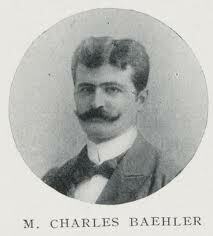 “What an esteemed company of players” introducing Charles Baehler, hotel owner and entrepreneur. “What an esteemed company of players!” Meet Count Laszlo Almasy. Count Laszlo Almasy a character who appears in my novel ‘Pomp and Circumstance’ and interestingly has become the main player in an iconic novel and subsequently a popular movie. After a day sightseeing, Ron and Mervyn, characters in The Merry Millionaire, hear about a notorious nightclub in the old town, and decide to give it a go, although Ron thinks it could be a bit too gay for the likes of him, seeing he is close to his forty seventh birthday. Known as ‘Les Dancing Dubois,’ apparently it is popular with young French and German sailors, which certainly has whetted our pair’s appetite. Freddy Farouk puts in an appearance. Having had the briefest of encounters with Egyptian Royalty towards the end of my novel ‘The Merry Millionaire,’ by sheer coincidence, on Saturday 27th February, 1937, my principle characters, Ron and Mervyn, in the sequel, namely, ‘Pomp and Circumstance,’ happen to share their return voyage from Egypt on the ‘Viceroy of India’ with young King Farouk. How ‘Durra Durra’ got its name. A sample chapter from Durra Durra by J.A. Wells: One evening, during their exploration along the river, Hume and Hovell happened upon a bend, where the stream was wide and strong, tumbling over rocks and boulders. It looked a likely spot to set up camp and they pitched the tents for the night. In the morning, Hume woke early and went to the riverbank to wash and shave. While he balanced his mirror on a rock, he caught site, in the reflection, a group of aborigines watching him.